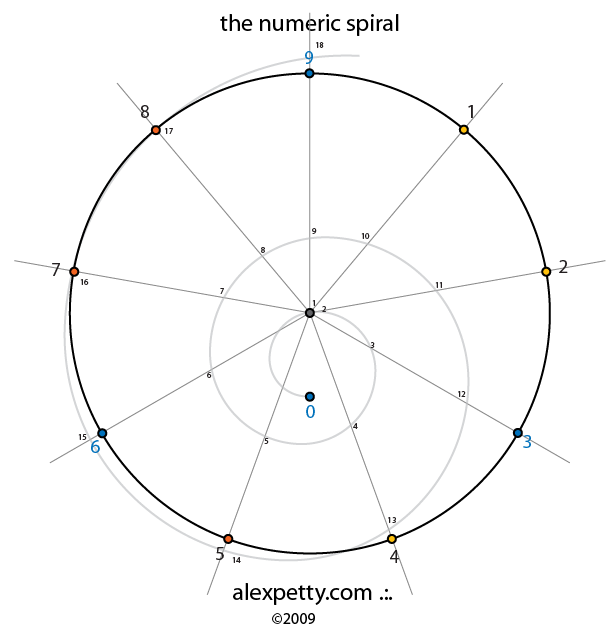 Is the periodicity of the elements a function of the periodicity of the octave? 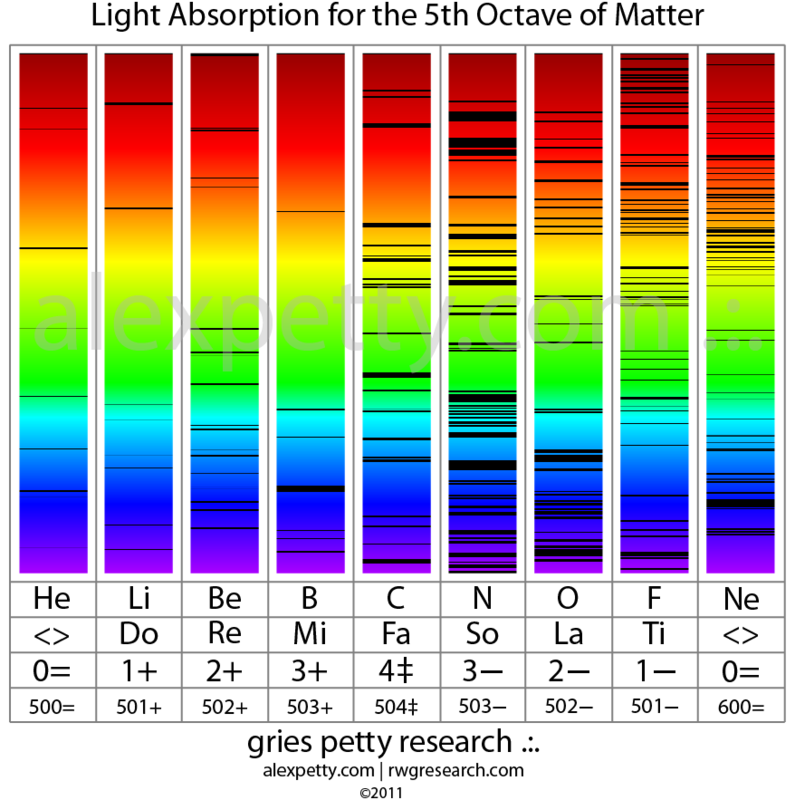 Is matter better understood as a manifestation of very high-frequency harmonics? 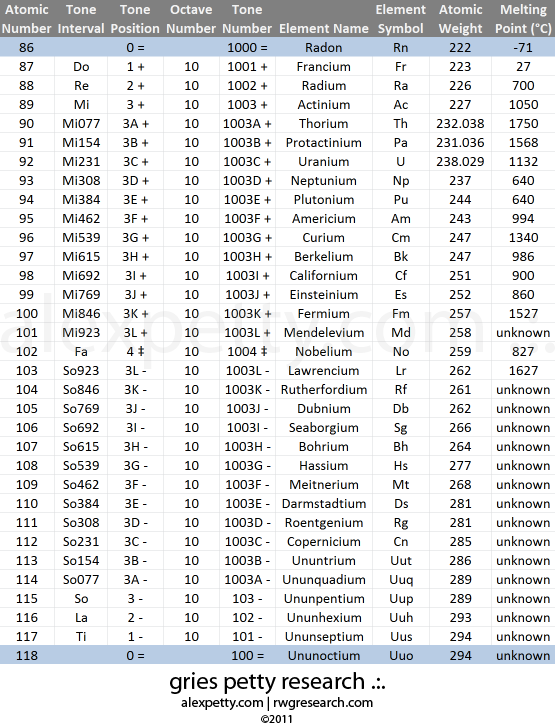 To approach this question lets first consider a listing of all the known elements that make up the physical universe. 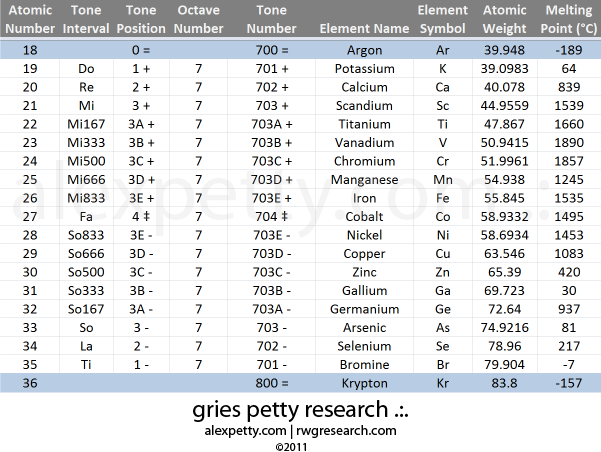 The standard periodic table is rectangular with counter-intuitive gaps occuring within the horizontal rows (called periods) to keep elements with similar properties grouped together in vertical columns (called groups), such as alkali metals, alkali earth metals, halogens and noble gases. 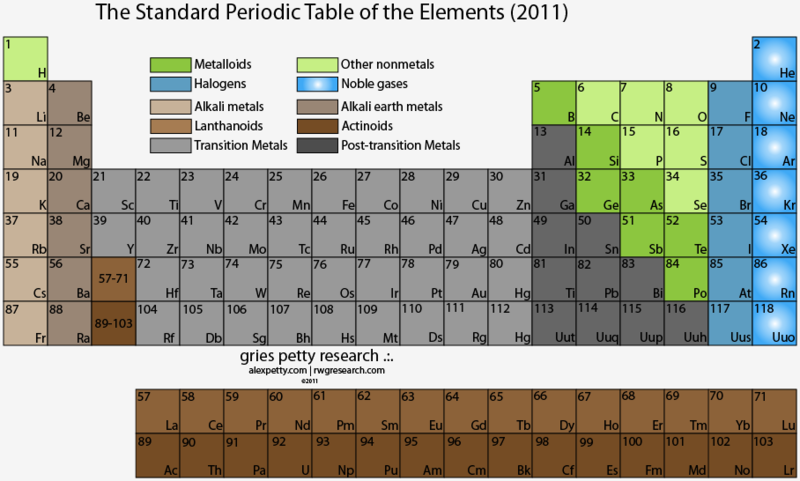 A wide, expanded view of the standard periodic table is shown below. Creation is caused by the subdivision of the conscious field into manifold parts through constructive or destructive acts of Mind resulting in the apparent existence of a universe of myriad parts; of subject and object. Energy is the native aspect of Mind which allows effect to flow from Mind-ignited cause so that a desired outcome may arise. Energy is Mind’s force of intention. The outward expression of the conscious field is the empty space that underlies all material form. The inward expression of the conscious field is the empty space of awareness that underlies all thought form. In both cases, this underlying spacious emptiness, outward (physical) and inward (mental) is one and the same. The still space between thoughts is same as the still space between stars. Everything perceived in Creation is manifested in the conscious field as an effect of the force of Mind, that is, as an effect of the constructive or destructive will of Mind. Light is the primary effect of causality. Light is exerted by Mind upon the conscious field and produces vibratory pressures thereupon. Human beings perceive these pressures as vibrations of light oscillating in empty space. Our eyes perceive a slim band of these frequencies as visible light which Mind translates into the human experience of sight. In this way, the effect, born of the primary, mind-ignited cause manifests visibly to the range of human experience. Many frequencies of light exist which are beyond our ability to sense directly. Certain ranges can harm the physical body, while others may soothe or heal it, and still others can have altering effects on states of consciousness. The creation mechanism that gives rise to the physical universe is when light, which is directly linked to primary causality; the will of Mind, imparts vibration and potential to empty space. The vast intelligence which has sustained the Cosmos by the force of it’s will and of which each human being is an inseparable part (as individual drops of water are inseperable from the ocean), has produced vast amounts of apparent “material substance” or ”matter”. These gases, liquids and solids serve as a further medium for the movement of energy through apparent space and time. Energy passing through material mediums yield second order effects cascading into subsequent degrees of complexity. An example of this is the transference of energy through the medium of atmospheric gas. This result is a pressure wave traveling through the air. When this pressure wave contains frequencies ranging between 20 to 20,000 cycles per second, human ears can translate these into the experience of sound in the Mind; cause and effect have come full circle. Energy moving through the medium of a conductor (e.g., copper wire) produces a charge pressure wave in the copper material lattice that can be used to create useful electronic devices. Here the cause and effect interaction is facilitating human inventiveness. 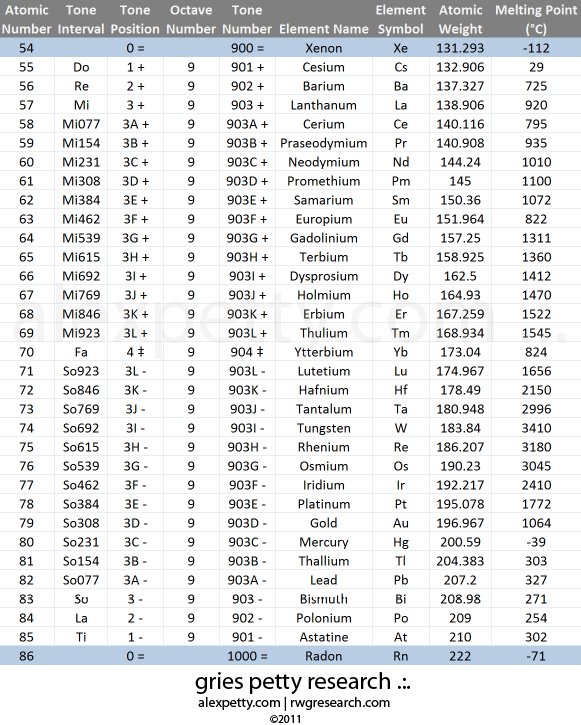 The elements of the Periodic Table are also an artifact of consciousness, of light. 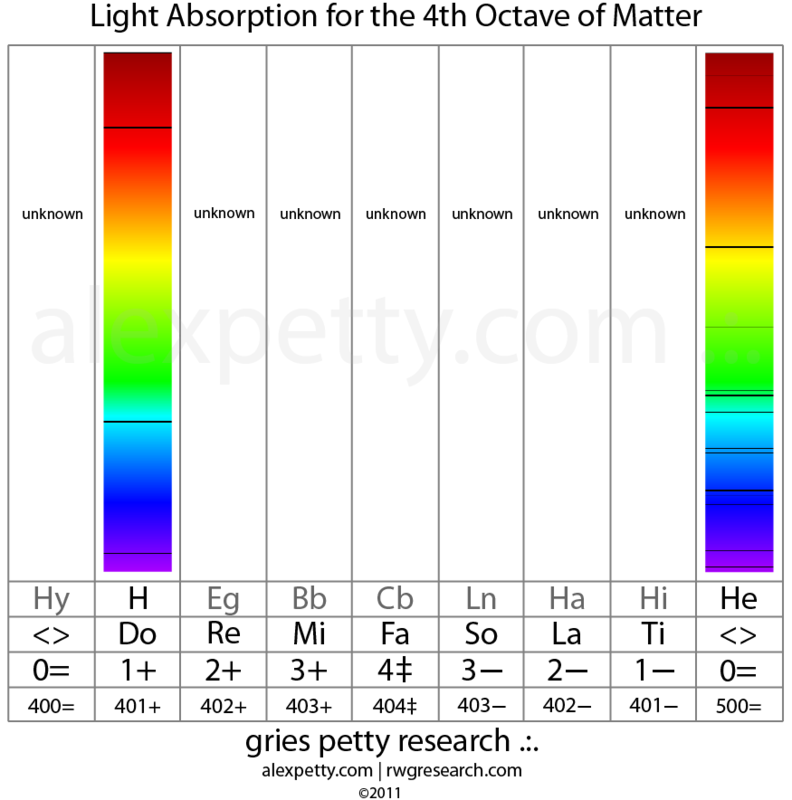 One way to empirically analyze the extremely high light harmonics that produce matter is by carefully studying the atomic absorption and emission spectra for the known elements. 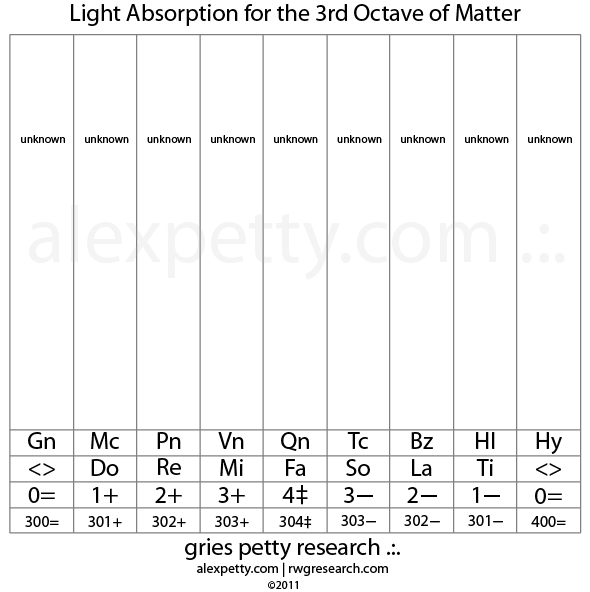 Each spectra provides a unique lower harmonic “light signature” for each element. It was also anciently said by the great Alexandrian master Hermes Trismegistus, “As above so below”. Both of these statements refer to the nature of energy. 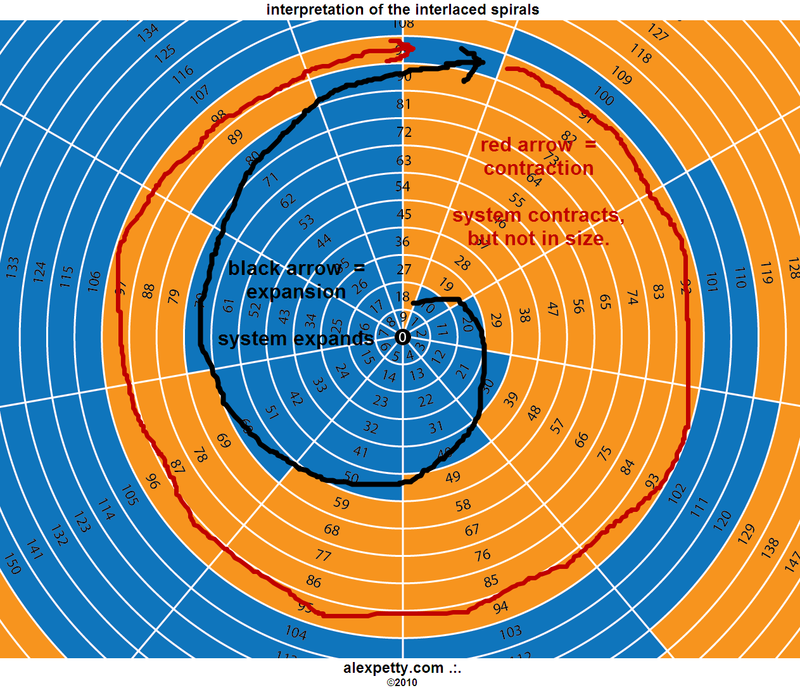 The cycling aspect of energy can be relied upon at any octave. Every octave of energy is identical to all others. The only variation in comparing one octave to another is scale. 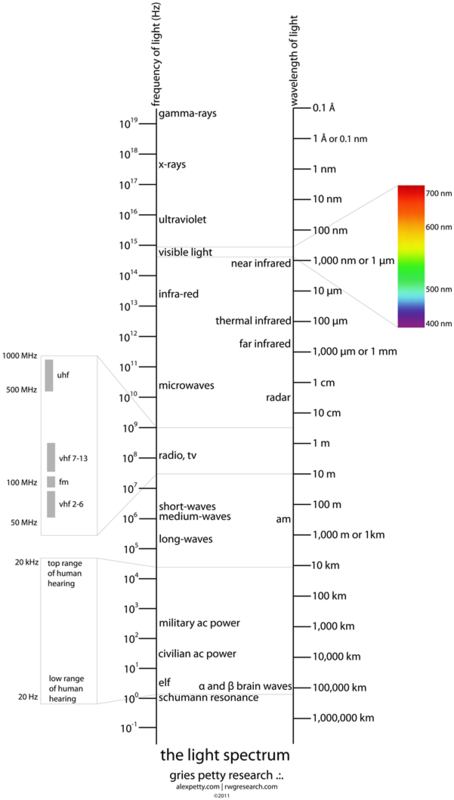 As the wavelengths grow longer, frequencies decrease – the energy and scale decreases. As the wavelengths grow shorter, frequencies increase – the energy and scale increases. We can experience this reliable, regular quality of energy when we hear the 7 major tones of the musical scale in the audio frequency range. The human ear is capable of perceiving a range of 10 octaves of energy. 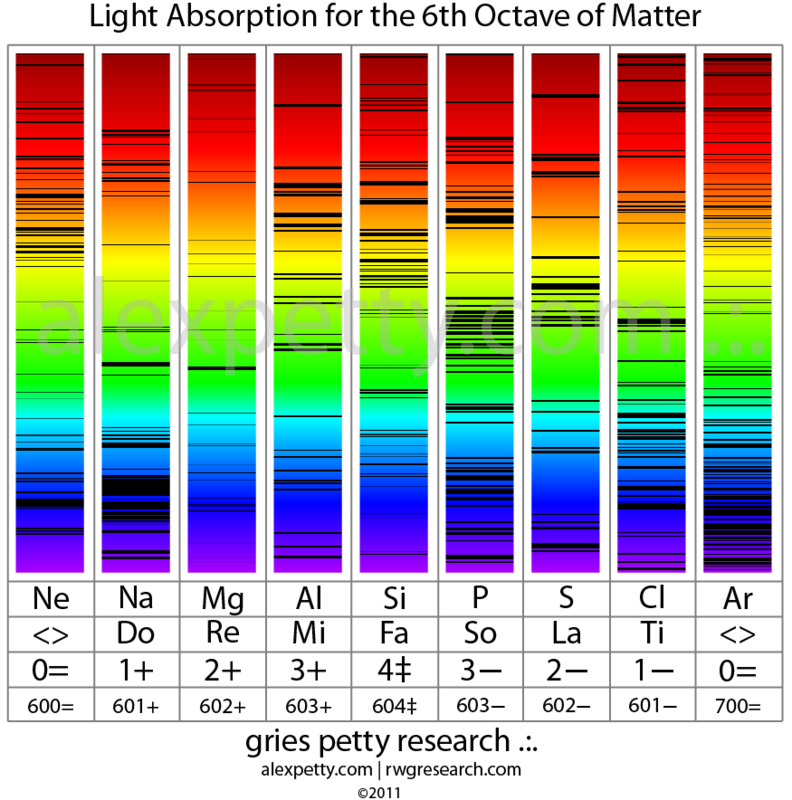 We can also experience this reliable, regular quality of energy when we see the 7 major tones of color in the frequency range of visible light. There is a direct correspondence here: as above, so below. 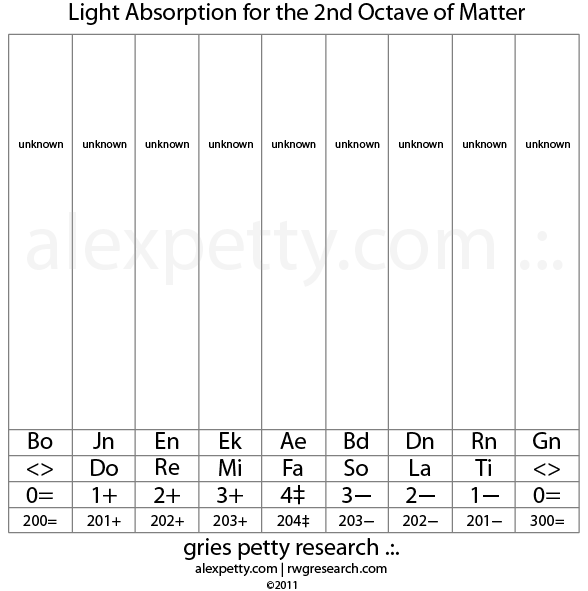 We see “Violet” in the higher octave, we hear “Do” at the lower octave. We see “Indigo” in the higher octave, we hear “Re” at the lower octave. 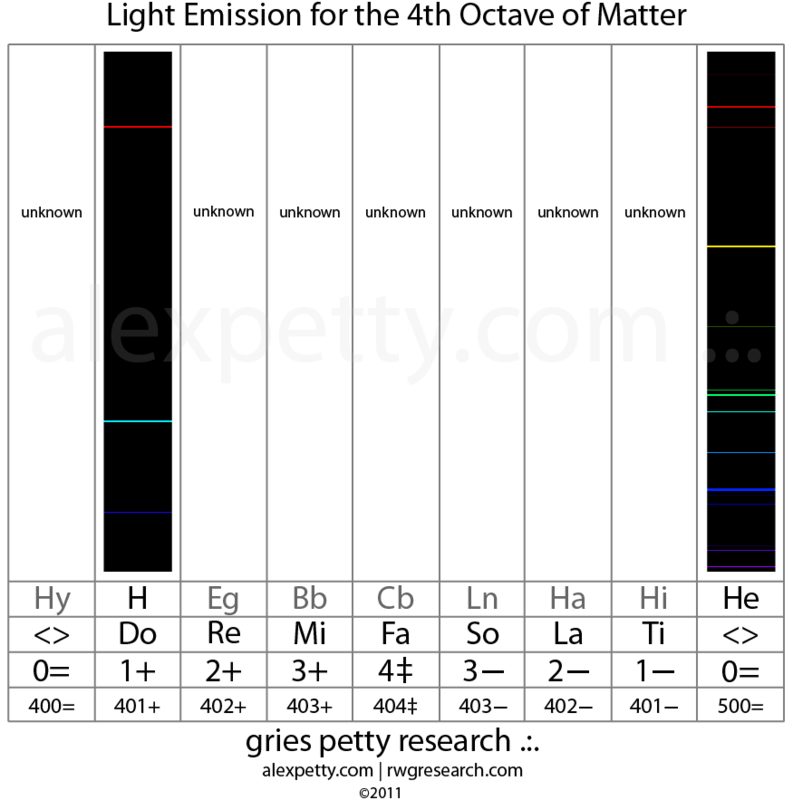 We see “Blue” in the higher octave, we hear “Mi” at the lower octave. 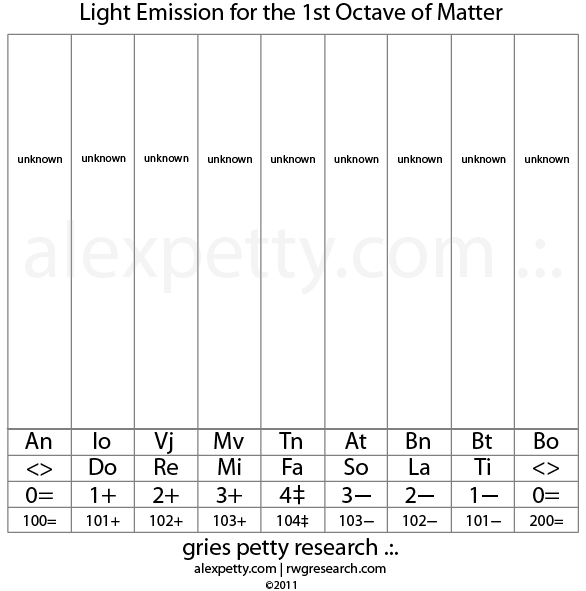 We see “Green” in the higher octave, we hear “Fa” at the lower octave. We see “Yellow” in the higher octave, we hear “So” at the lower octave. We see “Orange” in the higher octave, we hear “La” at the lower octave. We see “Red” in the higher octave, we hear “Ti” at the lower octave. The human eye is capable of perceiving but a single octave of energy. 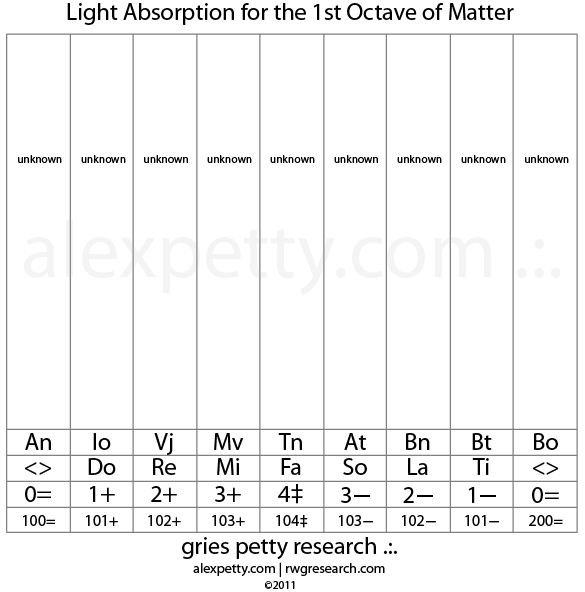 We experience this reliable, regular quality of energy as the 118 tones of known matter which span across 7 octaves. In other words, at an extremely high rate of vibration, in the wavelength range of perhaps 0.01 Å to 10 mÅ or shorter, light “condenses” into that which we perceive as matter. According to the gigantic conceptions of enlightened genius Walter Russell, there are 10 full octaves of matter. I have adopted Russell’s conventions in my work as his ideas are very well aligned with mine and I believe his conclusions on many counts are correct. 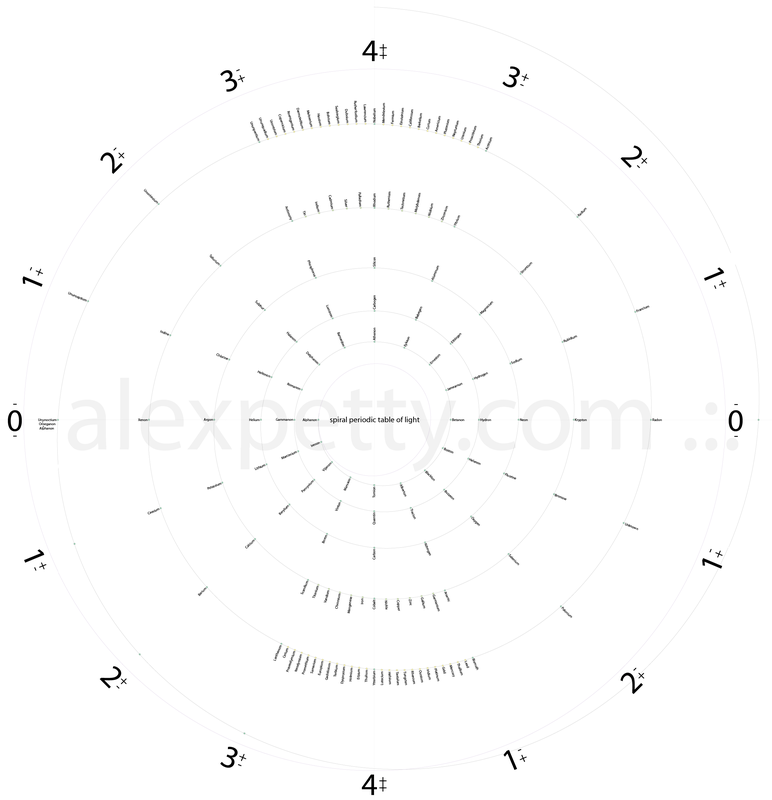 With the exception of Hydrogen, no tones in Russell’s predicted first four octaves have yet been observed in nature. It should also be noted that by 1927, Russell had already predicted the existence of a significant number of then unknown elements in the 9th and 10th octaves which have since been discovered. In fact in 1941, the American Academy of Sciences conferred a doctorate on him, after several laboratories had isolated the elements which he had foreseen: Deuterium, Tritium, Neptunium and Plutonium. 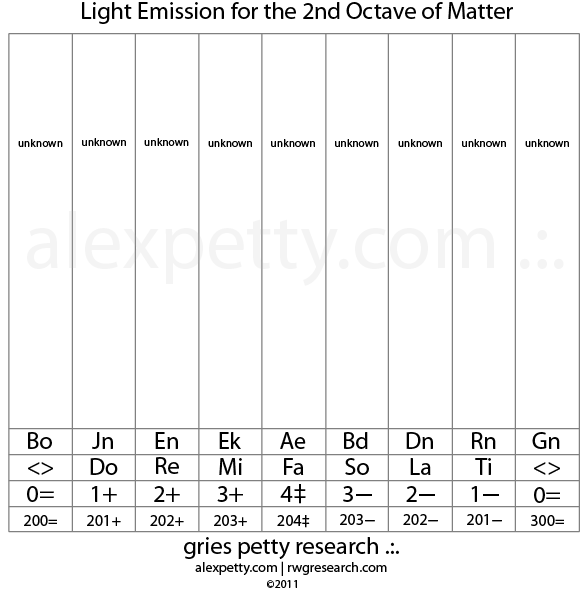 The figures below show how light cycles through the higher energy octaves appearing as matter at major tones and certain semi tones. 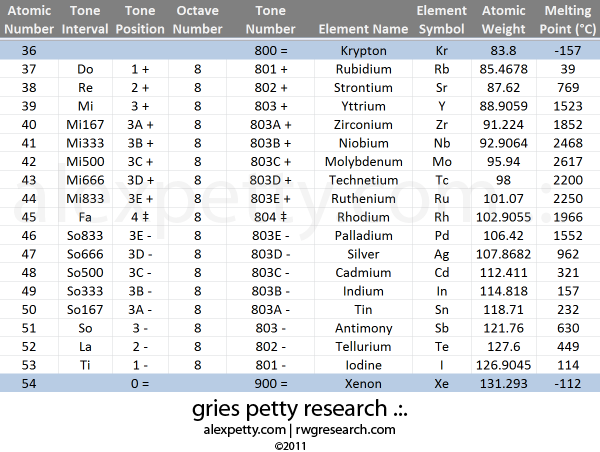 I have indicated the semi tones in “cents” between 0 and 1000. For example a semi tone falling half way between “Mi” and “Fa” would appear as “Mi500″. 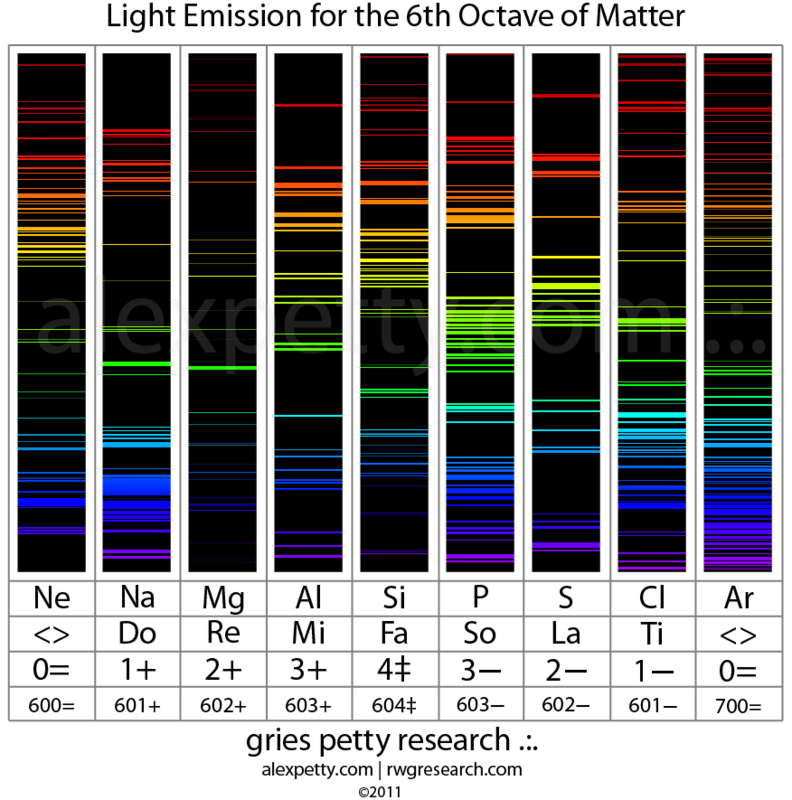 Note that the Noble Gases are at equilibrium and produce no physical vibration. 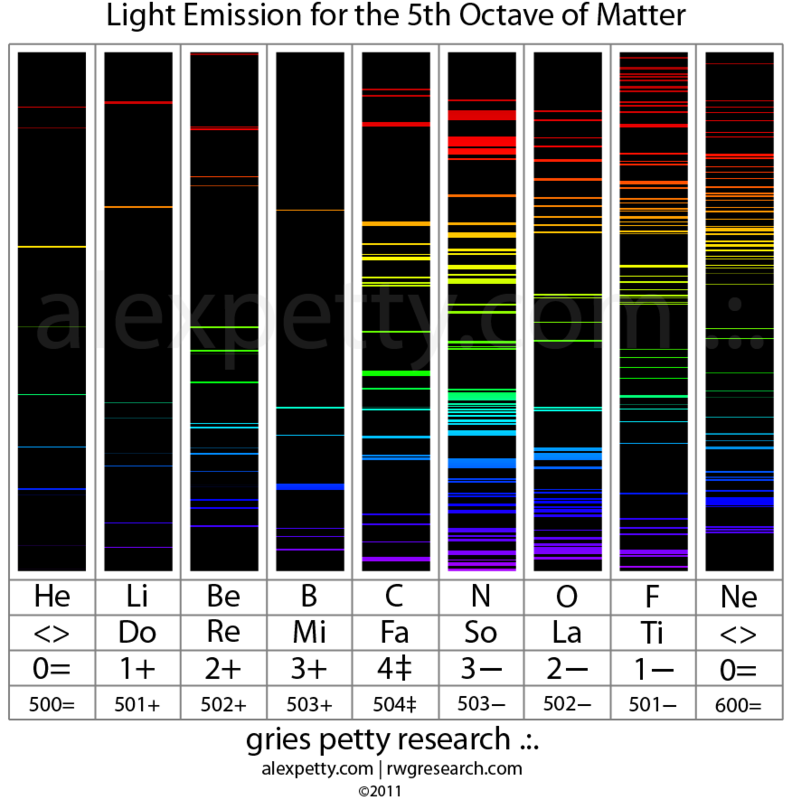 In this way, I think there may be some relationship between the nature of Noble Gases and that of Prime Numbers. so too is the periodic table more closely representative of matter’s true nature with all its periodicities when represented using a spiral rather than today’s less perfect rectangular representation. Thank you for your work. I appreciate it. 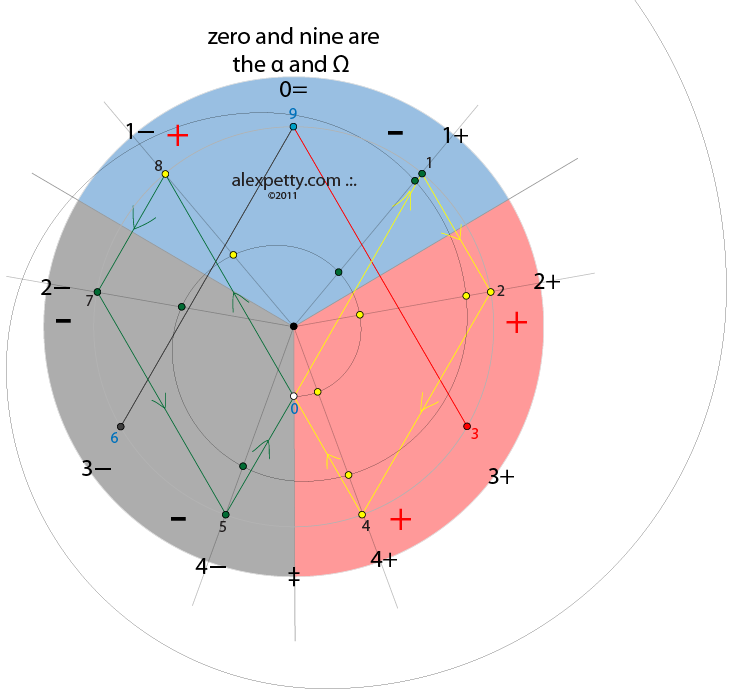 Have you found any pattern in location of healthy frequency vs. Damaging frequency? For example Oxygen vs. Fluoride, Infrared vs. Microwave and so on.